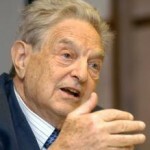 There isn’t much of a difference between Mitt Romney and Barack Obama, and George Soros knows it. Mitt Romney’s people helped Barack Obama design Obamacare. If Romney becomes president, Obamacare will not be repealed because it is virtually identical to his health care plan in Massachusetts.